Happy Valentine’s Day! What are you up to today? I’ll be having a cosy, intimate dinner at home with Mr STG this evening which I’m really looking forward to. And as it’s the universal day of love, I can’t let it pass by without showering some Valentine’s love on 50 of my gorgeous bride-to-be readers too! 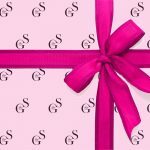 So I’m gifting 50 (yes 50!) 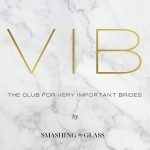 brides-to-be a FREE 30 day membership to Smashing The Glass’ Brides Club! I have never done anything like this before, but I’m doing it today as I’m in a very celebratory Valentines-y mood! BUT there are only 50 free places, and they’re only available today, Thursday February 14 . Once they’re gone they’re gone! The doors to Brides Club are closing for this quarter’s intake this Monday February 18, so if you’ve always wanted to try Brides Club, and haven’t quite got round to it, today’s the day to join! But wait…what exactly is Smashing The Glass’s Brides Club? 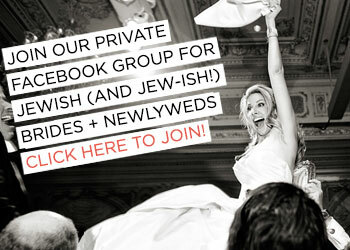 Brides Club is my members-only community for planning your perfect Jewish (or Jew-ish) wedding. It’s my biggest passion, and my 3rd baby (after my two little princesses)! 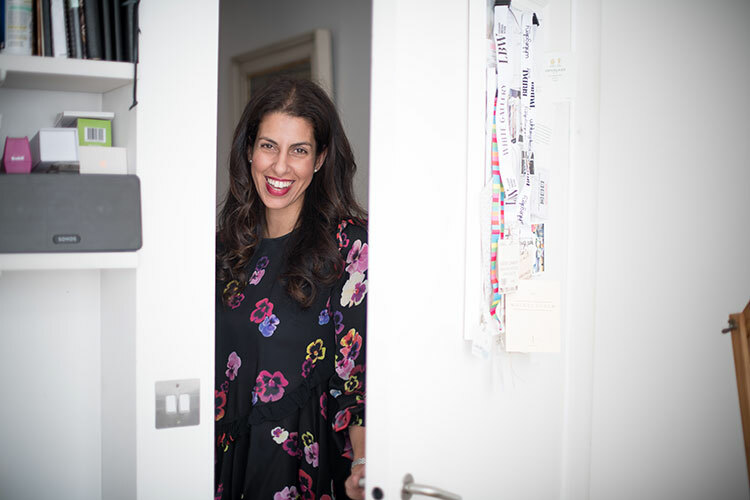 I set up Brides Club a year ago, in response to receiving 100’s of daily emails and DMs from brides-to-be wanting to know how to tailor Jewish wedding traditions / music / family dynamics / timelines / levels of Jewish-ness / mixing of cultures and faiths etc. to their personal Jewish wedding. I was also receiving daily requests for vendor recommendations and creative wedding ideas, and I absolutely LOVE helping with this kind of stuff (seriously – this is what I live for!). 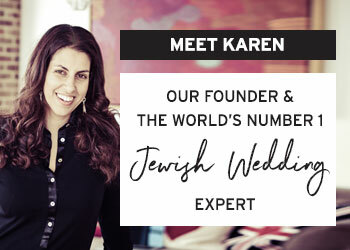 The spark was lit for creating Brides Club, a members-only community, dedicated exclusively to Jewish and Jew-ish Brides, and now, one year later, I’m proud to have helped 100’s of awesome Jewish and Jew-ish brides create the Jewish wedding of their dreams. Inside Brides Club I’m able to take away all the wedstress and all the ‘wedding information overload’. I help you plan every element of your wedding, ensuring you make decisions with clarity and confidence whilst keeping family and friends happy. I also ensure you get the most ‘bang for your buck’ with your wedding budget, and, most of all, ensure that planning your wedding is as fun and stress-free as the day itself! What happens inside Brides Club? 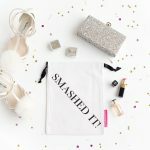 Aside from tailored advice, personal to your wedding, there are so many resources inside Smashing The Glass’ Brides Club to make sure your day is a smashing success. 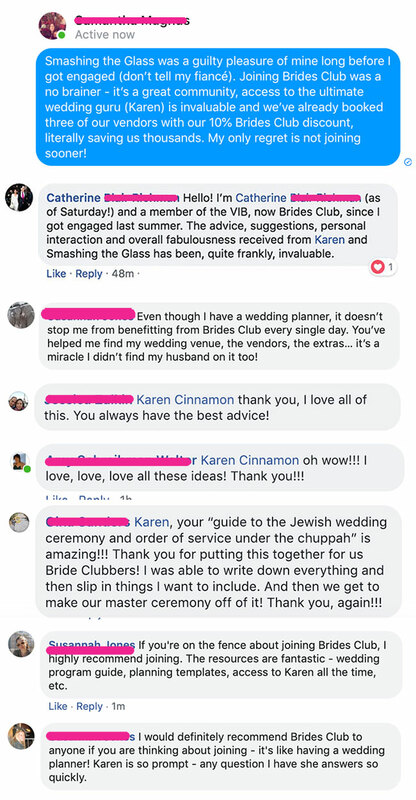 The Brides Club Members Area is a special section of Smashing The Glass just for Brides Club members, packed with resources, tailored advice, tips, and tricks to help you plan a Jewish or Jew-ish wedding that will leave you feeling joyful, not emotionally exhausted and overwhelmed. 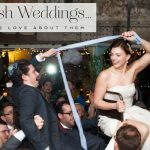 It’s where you can find your stage-by-stage planning breakdown – wherever you are in your planning journey, from just engaged to newly married. Every stage has its own section with helpful video guides and resources you’ll need to breeze through that stage. 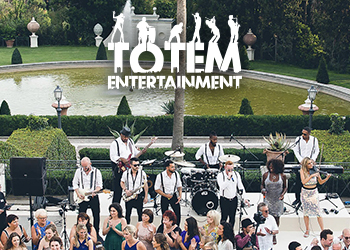 There’s also a section where you can access our full collection of Jewish wedding checklists and resources – everything from our ultimate Jewish wedding checklist to a list of questions to ask venues to Spotify hora playlists and a 1-week-to-go action plan, and so much more! These resources not only save you time and money, but also keep everyone around you happy. They’re literally Jewish Wedding Planning GOLD! 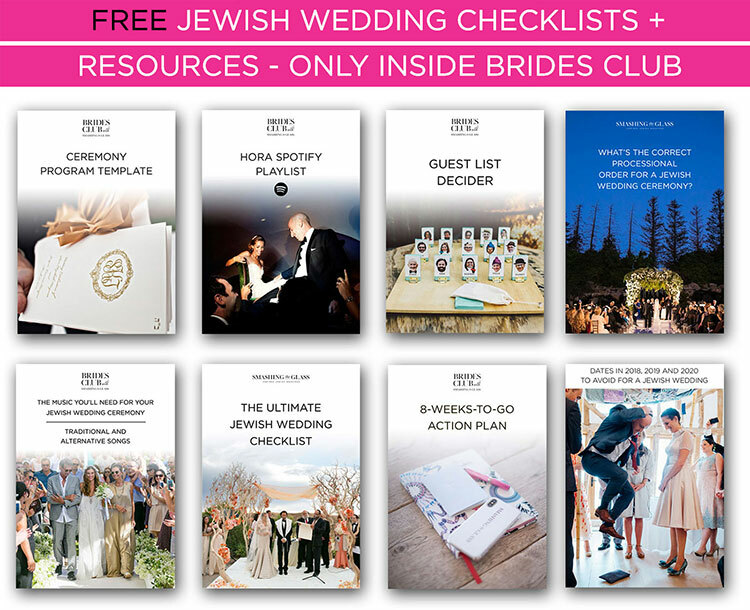 Whether or not you’re using a planner, whether you’re just engaged or a month out from your big day, Brides Club is your go-to spot for all the Jewish wedding step-by-step action plans, checklists, and resources. Non-judgmental support and reassurance from me, and lovely supportive brides-to-be going through exactly what you’re going through! *You’ll receive access to, and be eligible for, these extras if you choose to stay on as paying member after your 30 day free trial. After the 30 days there will be a monthly fee of $25 (or £19 if you are in the UK) and you can cancel at any time – there’s no contracts and no commitment. 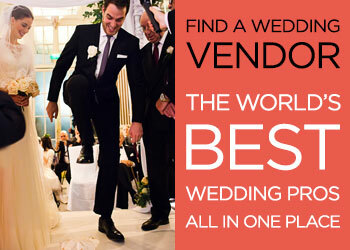 unlock access to 100’s of exclusive members-only 10% discounts for 100’s of wedding vendors and brands covering all styles, locations and budgets. And you can cancel at any time if you ever feel it’s not right for you – there’s no contracts and no commitment. I would SO love you to make our relationship official and have you inside Smashing The Glass’ Brides Club too. Just click here! PS If you’re reading this, and you’re a newlywed or vendor (and therefore the Brides Club gift isn’t a good fit for you right now! 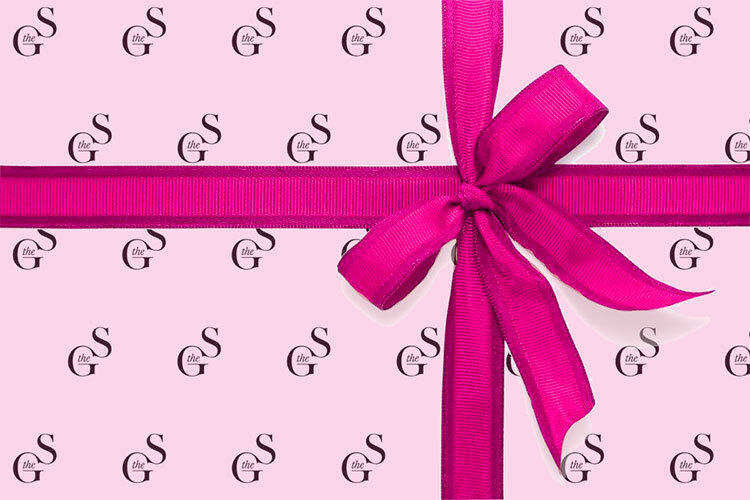 ), feel free to pass this offer on to other brides-to-be who this gift might be useful for! 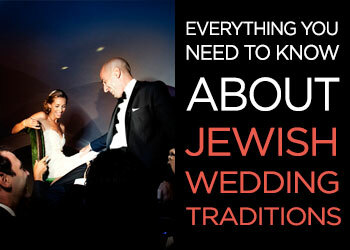 Membership Intake to VIB Club (our Members Club for Jewish and Jew-ish Brides) closes today!